meg is in Africa: Dance this mess around. I've always loved theme parties. I love attending them. I love planning them. I love finding the perfect costume. I love dancing. I've brought my theme party love to Benin. 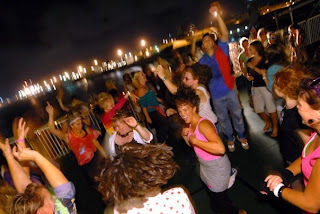 On Saturday night, some friends and I threw an 80's dance party on deck 8 of the Africa Mercy. When I woke up Sunday morning, completely exhausted and in need of Ibuprofen for a sore neck, I knew it had been a smashing success (coincidentally several other woke up feeling the same way). I was amazed at the caliber of the costumes everyone showed up in and even happier about how crazy/silly/fun everyone was while dancing. There was no need to be cool. Just the way it ought to be. At one point, I estimate there was 50 people on the dance floor, of all ages, from all different departments on the ship. It was a great community building experience. I couldn't help but just feel blessed to be here. How many opportunities do you get in life to throw an 80's dance party on the top of a hospital ship with dear friends from all over the world.